NEXT HOME GAME: The Go Goodwins Manchester Storm face the Braehead Clan at the Storm Shelter on Sunday the 10th of January (5:00pm face-off) in Elite League action. Tickets can be purchased online via the website, calling the box office on tel: 0161-926-8782 or on the day at the box office. A sold-out Silverblades Ice Rink Altrincham saw the short benched Go Goodwin Coaches sponsored Manchester Storm fall in overtime to the Sheffield Steelers in the most thrilling game of the Elite League season so far. The first period saw the Storm, who were playing for the final time this season in their retro jerseys, take the lead just before the 10th minute mark thanks to a zinger of a goal by Paul Phillips, scoring his 9th of the season. Storm continued their hard checking and simple style hockey for the remainder of the period. The Steelers were able to get on the board early in the second, thanks to Jason Hewitt netting his 4th of the season just before the 2nd minute. The Storm were undeterred though, and were back in the lead less than 30 seconds later due to on loan player, Adam Harding, finding the back off the net off from a precision pass by Matt Paton. Not happy with just a single goal lead, Patrik Valcak grabbed his first of the night 30 seconds later to send the Storm Shelter to it’s feet once again! Valcak then scored his second of the evening while the Storm were on the Power Play, after an impressive period of tape to tape hockey by the Manchester men. The third period however was when fatigue would start to set in on the Storm. The Steelers were able to bag 2 quick goals while both teams were playing 4-on-4, before netting the equalising goal with 1:40 left on the clock. The 3rd period ended with with both teams on 4 goals each, meaning we headed to sudden death 5 minute 4-on-4 overtime. The Steelers set up in the Storm’s end for the majority of the overtime, with shot after shot heading towards Zane Kalemba in the Storm net. Despite this, the Storm were able to keep the Steelers out, including a penalty shot, before a deflected shot went under Zane and into the back of the Storm net with 2:12 left in over time to give the Steelers the win and the extra point. 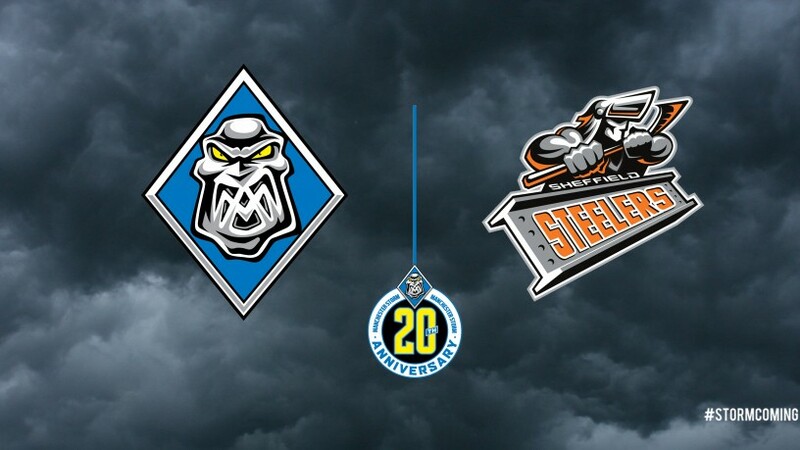 Final score after overtime: Manchester Storm 4-5 Sheffield Steelers.